The Bible is an honest book, stating things as they are. It says Rahab was a harlot, a woman who sold her body for money. Some people try to downplay this by saying she was just an inn-keeper. However, in those days, only men were innkeepers. In written bills of that time, the cost of the bed is listed as a girl, whose services would have been included. Rahab may have been in such a place. It was therefore natural for the spies to lodge there as it would have been the only place to stay in a small place like Jericho. Somehow, the king of Jericho heard there were Jewish scouts in the city and called for their immediate capture. They were probably not dressed like people in Jericho, so they would have stood out. Meanwhile, Rahab had become aware of the true identity of her guests, and had hidden them on her roof under stacks of flax. Her house would have been built on the double city wall, so it would have been higher than any other, preventing it from prying eyes. The spies were safe. Rahab misled the king’s messengers. Then, while they were searching the countryside, she talked with the spies. She told them she knew that God had given them the land. Her people had heard about the miracle God had done for them, in parting the Red Sea, and this was forty years after the fact! She said the men of Jericho had lost courage to face the Israelites because of their God. She was a wise woman who acted in light of proper information. She used discretion in talking about them and shrewdness in hiding them. She was hoping that in light of what she had done for them, they would do something for her. “Since I have saved your lives, will you in turn save mine and that of my relatives?” She makes them swear by God because she knew then they would keep their promises. She was sure that when the people of Israel attacked, her people didn’t have the slightest chance against them. She had heard what they had done to the kings, Og and Bashan.She asked for a sign that they would save her when their armies returned to take the city. They told her to put a scarlet cord on her window and no one who was inside with her would be harmed. Some commentators think this scarlet cord represented her occupation. It was her ‘red light’ in the window, and therefore would not arouse suspicion. That may or may not be true; but it represented an agreement between the two parties. As soon as they left, she bound the cord. She took it seriously and didn’t want there to be any mistake. Faith is a fixed and profound trust in God and the Word. Rahab had this kind of faith. Therefore, God took her tarnished portrait, cleansed it and hung it next to Sarah in the gallery of the heroes of faith (Heb. 11:1, 30, 31). These two women are the only two females in a long list of men. Rahab, like Sarah, a heroine of the faith? Yes, for God is no respecter of persons. There are no impossible cases with Him. He justifies the ungodly. This was only the beginning. She lived in Israel,gave up her former way of life, married an Israelite named Salmon, and became the father of Boaz, the husband of Ruth. Rahab becomes the great-grandmother of King David. Scripture doesn’t tell us the names of the two spies sent to Jericho, but the romantic in me likes to think one of them was Salmon, who eventually became her husband. I believe he was impressed with her faith in a God she had only learned about from afar. It was the original two spies who were the ones who personally retrieved Rahab and her family from Jericho. It seems Joshua didn’t need the report of the spies in order to know to attack the city. So why were they sent? Because a sovereign God was searching out a particular woman to be saved. The reason Rahab was protected? Because she protected the spies. Her whole family was saved physically, but only Rahab chose to continue to live among the Israelites.Only she had true faith. But notice they needed to be inside the house to be protected. Likewise, merely knowing that Christ is our shelter from judgment does us no good on its own. We must be in Christ. 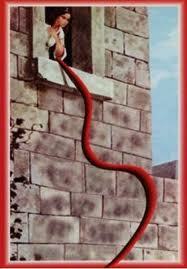 And like Rahab, we must hurry to secure our eternal safety. The scarlet cord is a symbol that’s often used when speaking of how Christ is hidden in the Old Testament, woven into the familiar stories, hinted at in symbols and types and shadows. The whole Bible, both Old and New Testaments together, speaks of Christ. From the first promise of a coming Messiah in Gen. 3:16 to the Passover Lamb and the Manna from heaven, and the rock smitten to provide water for the people of Israel, to the bronze serpent on the pole, to the sign of Jonah in the depths for three days; He is there, until he appears in the New Testament in fulfillment of the prophecies of the Old Testament. He is the Scarlet Cord that saves those who believe what He says. We must be ‘in Christ’ to be safe from judgment. Question– How do you think Rahab would have been accepted in Israel? How comfortable are you in dealing with people who have been saved from a sordid or scandalous past? Do you only associate with people who are ‘like you’? Response– Research a group like International Justice Mission or Carey Outreach Ministries. Prayerfully consider how you can help (prayer/financial support) of the aftercare of women rescued from human trafficking for sexual purposes. These organizations provide counselling and teach life and job skills. The women are also redeemed (bought back) from their abductors/pimps. excellent writeup….I guess I had heard of Rahab but never knew the story of the scarlet cord and never really “got it” before now…just one more of God’s “miracles” …wow….and I am an avid student of the Word. Thank you God for “revelation” and for leading me to this story now as I needed it and thank you Pia for sharing it. The Holy spirit really used it to minster to me and give me faith and strength thru a very difficult situation that I am dealing with right now…Praise God! You know what I love about blogs? A post written more than a year ago can be so relevant and timely. I just love the way the Spirit works. Thank you for taking the time to write and may God bless you immensely. He’s amazing that way, isn’t He? I’m glad it touched you. Reblogged this on The Scarlet Thread. Fantastic blog. I love how you brought the concept of Christ interwoven through history, that cord of hope for all of us, no matter what the circumstances. You are in Christ because He is “IN” you—the Aleph Tav! i wish to add something regarding the mention of rahab in the hebrews 11. among the names mentioned in that chapter, she is the only case with the occupation mentioned. i guess that means faith saves us despite our occupation.